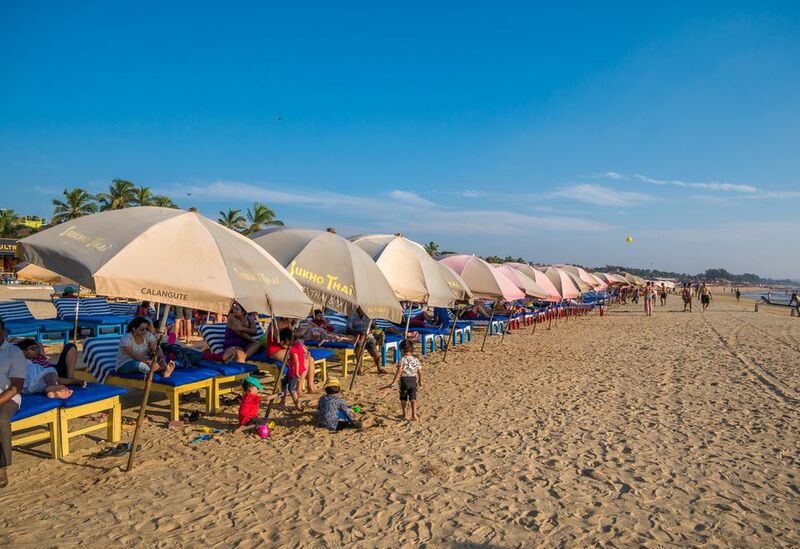 For sure, Goa's Baga Beach may be commercialized and really developed but for those who like action, it’s one of the most happening beaches on the coast. You'll find everything from water sports to fine dining restaurants there, along with bars and clubs. Baga Beach is situated in North Goa, 9 kilometers (6 miles) from Mapusa and 16 kilometers (10 miles) from Panaji, the state capital. It's bordered by Calangute Beach to the south, and Anjuna Beach to the north on the other side of the river. Baga Beach starts right where Calangute ends, although it's hard to pinpoint exactly where. The closest railway station to Baga is Thivim. Expect to pay around 600 rupees in a taxi to get to Baga from the railway station. Alternatively, Goa's Dabolim airport is located 50 kilometers (31 miles) away, and the fare in a pre-paid taxi is about 1,300 rupees. Luggage and late night charges are extra. The weather at Baga is warm throughout the year. Temperatures rarely reach more than 33 degrees Celsius (91 degrees Fahrenheit) during the day or drop below 20 degrees Celsius (68 degrees Fahrenheit) at night. Some winter nights can get a bit chilly from December to February though. The tourist season kicks off in late October and starts slowing down around March. Humidity increases dramatically during April and May. Baga receives rain from the southwest monsoon from June to August. The beach huts close during this time, although many nightspots remain open. Waters ports are a huge attraction. You can go parasailing, wake boarding, windsurfing, kite surfing, or take a ride on a jet ski. Dolphin spotting trips and island trips are other popular options. It's not the type of attraction you'd expect to find at a beach but Baga also has an indoor snow park with play area, sledding area, and ice bar! Shopaholics can trawl the markets and shops. There's a Tibetan market that runs along Baga Road. Ingo's Night Market in nearby Arpora is legendary, as too is the Wednesday flea market at Anjuna. The Goa Collective has started a new market at Hilltop in Vagator on Saturdays as well. Baga is well known for its commercial nightlife, most of which can be found in and around Tito's Lane -- home to the infamous Club Tito and Cafe Mambo. Both hold regular events with interstate DJs. Many people don't think Tito's is worth the money though, despite the hype. (Single guys can expect to pay around 2,500 rupees cover charge, although there's free entry for ladies). Cape Town Cafe is widely regarded as the best place to party on Tito's Lane. Cocktails and Dreams draws a crowd too. It has wide variety of cocktails and shooters, and barmen with impressive flame juggling skills. Fiesta (opposite Club Titos) will take your breath away with its magical poolside setting and scrumptious European and Mediterranean cuisine. Britto's, a beach shack specializing in seafood, is a wildly popular tourist place that serves Goan cuisine that's not too spicy for the western palate. Find it at the far northern end of the beach. You can dine on a table right on the beach. Classy Go with the Flow, tucked away beside the river, has a lovely views and an international menu. The restaurant donates its profits to charity. The River Restaurant at the Acron Waterfront hotel is recommended for gourmet Goan fusion food as well. Acron Waterfront has an enviable riverside position and is ideal for those who want to splurge. This outstanding boutique hotel is an architecturally transformed ancestral property. Facilities include an outdoor swimming pool, spa and wellness center. Expect to pay about 10,000 rupees per night for a double room. Next door to Acron Waterfront, the funky Beach Box concept hotel is made out of converted shipping containers and up-cycled materials. Expect to pay 2,600 rupees per night upwards. The Keys Select Ronil Resort is a reliable, long-standing favorite with double rooms from 3,850 rupees per night. It's centrally located opposite Tito's Lane, only five minutes walk from the beach. Colonia Santa Maria is a more upmarket and has cottages leading to the beach for about 6,000 rupees per night upwards. 16 Degrees North is a relatively new designer boutique hotel by the river with rooms priced around 7,000 rupees per night, although cheap deals are often available. Alternatively, Hotel Bonanza is a decent option for those on a budget. Baga is attracting a growing number of Indian tourists, including during the monsoon season in Goa. Many of them are groups of guys who head there for the party scene. Unfortunately, not all of them behave well. Do be aware that drunken and rowdy behavior is frequently an issue in the area. Women may feel uncomfortable as a result of this. Women may also feel uncomfortable wearing a bikini on the beach. It's likely to attract unwanted attention from Indian men who are not used to seeing so much bare skin. Galgibag Beach: South Goa's Best Kept Secret?